The American mid-1944 campaign in the Mariana Islands was an important strategic step that placed Tokyo and the rest of Japan’s industrial heartland within range of the new U.S. Army Air Forces B-29 very-long-range bombers. Once the islands were secured and the airfields were built, the new Twentieth Air Force could do to Japanese industry what its strategic counterparts in Europe had been doing to German industry since mid-1943. 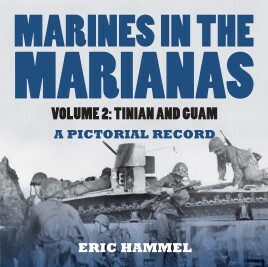 Relying mainly on 290 gripping photos gleaned from government archives, many with extended captions, veteran military history author Eric Hammel has created a stunning and coherent battle history dedicated to the memory of the United States Marines who endured the bloody campaigns to secure Tinian and Guam from their stubborn defenders.